Employee morale can ebb and flow in an office environment. Sometimes dips in morale have nothing to do with actual work — it could mean people are struggling with personal issues and it’s seeping into their professional life. The trouble is, emotions are contagious. We start mimicking each others faces when we’re just hours old and it doesn’t stop in adulthood. At work, positive feelings can spread throughout your staff, just like negative ones — and both can spread through your work and impact morale. If you notice that multiple employees are displaying negative behaviors (eye-rolling, sarcastic comments, reluctance to get work done, or coming in late), it may be time to boost morale at work. Boosting employee morale doesn’t have to involve a series of complicated incentives. 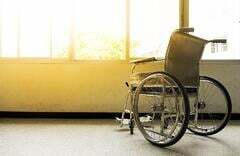 Most of the time, it’s about providing some outwardly noticeable benefits that your workforce enjoys — the kinds of things they’d tell their family and friends about when boasting about the place they work. 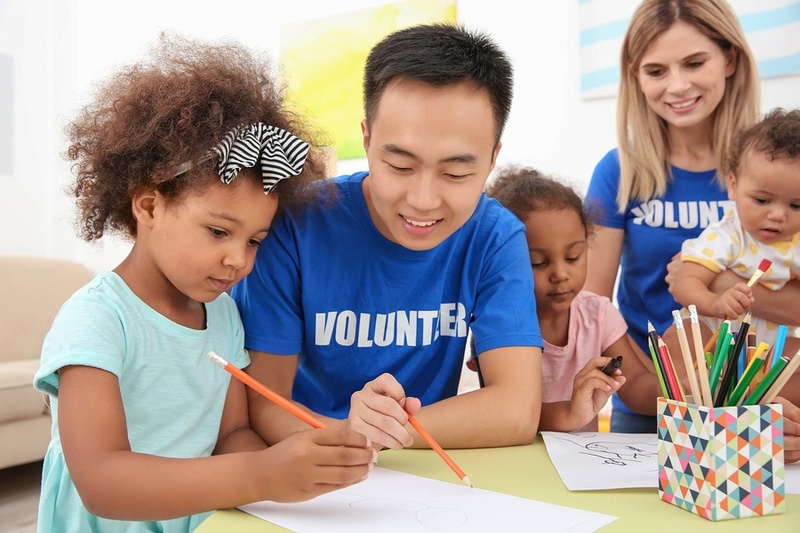 Since millennials (and their successors, Gen Z) are so interested in community service, a simple way to boost morale at work would be by allowing employees to take a day off to devote to community service. This could be a designated day of the year — like Giving Tuesday — when you could organize groups of employees who would go to different non-profits in your area (which is how we do it at the JP Griffin Group). Performing community service in groups oftentimes builds camaraderie among employees, which will boost morale at work all by itself. And if employees have a particular cause they feel strongly about that your company doesn’t work with, let them take the day off to give back to their favorite organization. Helping others makes us all feel good, so why not carve out the time to let your workforce give back to the community. In turn, we’re sure you’ll feel a morale boost when they return to work the next day. Be sure to take pictures and post them up in the kitchen or break room so everyone can celebrate the experience together and learn about what their coworkers did with their day of service. And while you’re at it, take a moment to talk about it on social media (complete with pictures!) so potential employees see this great perk they could participate in. We could all use a dose of positivity on social media these days, anyway. Along those same lines, you can get your workforce involved in raising money for charity by holding “dress down days.” Employees could pay $5.00 (or more) in exchange for wearing jeans to work on Fridays. This could extend for a few Fridays, rather than one day — especially if you have a small staff — to allow for a larger donation. You can even ask for input from your employees regarding which charities mean the most to them and choose ones that align with the mission of your company. To avoid uncomfortable conversations later, it would be a good idea to write up a quick policy defining what “dress down” means. For example, jeans and dresses are acceptable, but tube tops and flip flops are not, and obviously, this event should never be held when an important client will be visiting the office. Again, this goes back to people feeling good about helping others. It’s a simple way to boost morale at work and employees get to wear more comfortable clothes. It’s a win-win. 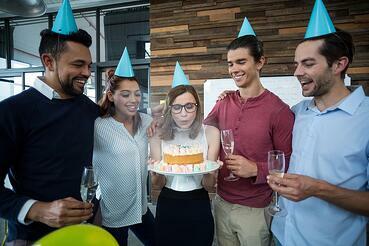 Holding birthday or work anniversary celebrations can be a fun (and relatively cheap) way of boosting morale at work — and if anything, almost everyone loves an excuse to eat cake. Depending on the size of your staff, you may want to consider monthly birthday or anniversary celebrations, as opposed to each individual’s special day. That way you can celebrate any and all employees who have birthdays or anniversaries that month. No one even has to sing, if they don’t want to! It doesn’t have to be long — maybe only a half hour or less — but your staff will enjoy having the little break from work and feeling like they’re appreciated will help naturally build employee morale. Kids aren’t the only ones who get spring fever. If your business is in a climate where the weather shifts dramatically throughout the year, adults and children alike are more than ready for spring and summer. If your business is in a warmer climate (like our setting here in the Valley of the Sun) your employees may literally be running for the hills on the weekend. Therefore, an easy way to boost morale at work is by letting your employees go home a bit early on Fridays in the summer. This could even mean an hour or two — regardless, everyone will be excited to leave early and enjoy a jumpstart on their weekend. A good alternative would be to let employees leave early on three-day weekends, which is something we sometimes do at the JP Griffin Group. If a holiday falls on a Monday (and the workload allows it), we let our employees go at noon on the Friday prior, so people can beat holiday traffic. If your specific industry is busiest during the summer, consider doing this in your off-season. Even if it’s winter, employees will enjoy leaving work before dusk and beating rush-hour traffic, or leaving work early to knock out some holiday shopping without the kids. Something that often gets lost in the shuffle of daily work is taking time to publicly recognize accomplishments. This could mean landing a new client, putting on a successful event, selling more than the previous quarter, or any other positive thing happening at work. You could have a monthly email recapping the excellent things your employees accomplished during that period, or you could discuss them at staff meetings (if that’s something you do regularly). You could even have a recognition program (like top sales for the month or quarter) that comes with some sort of prize — like an Amazon gift card, a free lunch, or VIP parking if your parking lot is huge or there is a long walk from the lot to the office. Regardless of how you decide to do it, taking a few moments to recognize employees for their hard work and dedicated service is a simple, but effective way to boost employee morale. Some employees choose to eat lunch at their desks so they can leave earlier, and if that’s the case, then let them do it, but others feel like they have to be chained to their desks because of pressure from their bosses or clients. However, most people can’t sit at a desk all day without a bit of a break — and none of us really should anyway. It’s good for our productivity to give our brains a rest, but it’s also important for our bodies to stand up and get our blood flowing a little bit. Encourage people to get up and out of their offices for lunch. This may mean investing a little bit into a space where they can go — perhaps a break room or an outside seating area (with tables, not just benches). And if you’d like to give people a little extra incentive, provide free lunch once a month or bagels on Fridays. You may find your employees are more willing to take the break. If an entire office can’t be gone at the same time, help them create a schedule to stagger their lunches so someone is always present. This minor shift in culture can produce major results for employee morale. If your business is in an area that experiences inclement weather (whether that means extreme heat or cold, snow, or hurricanes), having a lenient policy about working from home (or coming in late so the salt trucks can do their thing) can go a long way. If schools are closed, someone will need to be home with the kids. Others may not feel comfortable driving on icy roads to get to work. Having flexibility those days can alleviate stress and anxiety and can give employees a nice morale boost. Figuring out if your changes are actually boosting morale at work may lie in the power of observation. Are you employees smiling more? Are they generally more positive throughout the day? Do you hear more laughter in the office? You’ll know you’re really on the right track when your employees start bragging about their perks. When you see more job applicants per position, when your Glassdoor rating goes up, and when your employees start referring people to your company, you know what you’re doing is working. So feel free to experiment, remember to get employee feedback, and be sure to set a good example! Be kind, patient, and have a positive attitude. Perhaps you’ll notice your positivity catching on over time. What are you doing to boost morale at work? Leave us a comment below or contact us. We’d love to hear what’s working for you!